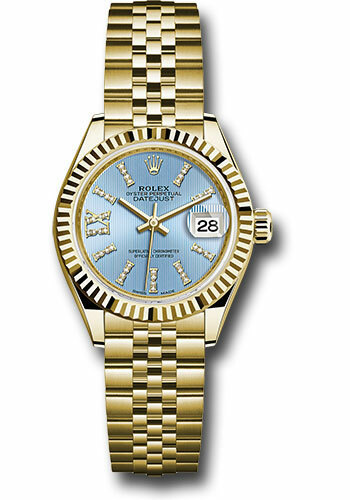 28mm 18K yellow gold oyster case, screw-down crown with twinlock double waterproofness system, fluted bezel, scratch-resistant sapphire crystal with cyclops lens over the date and double anti-reflective coating, cornflower blue stripe dial, 36 diamonds set in index hour markers and 8 diamond set in Roman numeral IX, Rolex calibre 2236 automatic movement with center hour, minute and seconds hands, instantaneous date with rapid setting, and stop-seconds for precise time setting, 18K yellow gold Jubilee bracelet with five-piece links, concealed folding Crownclasp buckle. Waterproof to 100 meters. 28mm 18K yellow gold oyster case, screw-down crown with twinlock double waterproofness system, fluted bezel, scratch-resistant sapphire crystal with cyclops lens over the date and double anti-reflective coating, champagne dial, 9 diamonds set in star shaped hour marker settings and 8 diamond set in Roman numeral IX, Rolex calibre 2236 automatic movement with center hour, minute and seconds hands, instantaneous date with rapid setting, and stop-seconds for precise time setting, 18K yellow gold Jubilee bracelet with five-piece links, concealed folding Crownclasp buckle. Waterproof to 100 meters. 28mm 18K yellow gold oyster case, screw-down crown with twinlock double waterproofness system, fluted bezel, scratch-resistant sapphire crystal with cyclops lens over the date and double anti-reflective coating, champagne dial, index hour markers with Chromalight, Rolex calibre 2236 automatic movement with center hour, minute and seconds hands, instantaneous date with rapid setting, and stop-seconds for precise time setting, 18K yellow gold Jubilee bracelet with five-piece links, concealed folding Crownclasp buckle. Waterproof to 100 meters. 28mm 18K yellow gold oyster case, screw-down crown with twinlock double waterproofness system, fluted bezel, scratch-resistant sapphire crystal with cyclops lens over the date and double anti-reflective coating, lilac stripe dial, 36 diamonds set in index hour markers and 8 diamond set in Roman numeral IX, Rolex calibre 2236 automatic movement with center hour, minute and seconds hands, instantaneous date with rapid setting, and stop-seconds for precise time setting, 18K yellow gold Jubilee bracelet with five-piece links, concealed folding Crownclasp buckle. Waterproof to 100 meters. 28mm 18K yellow gold oyster case, screw-down crown with twinlock double waterproofness system, fluted bezel, scratch-resistant sapphire crystal with cyclops lens over the date and double anti-reflective coating, linden green strip dial, 36 diamonds set in index hour markers and 8 diamond set in Roman numeral IX, Rolex calibre 2236 automatic movement with center hour, minute and seconds hands, instantaneous date with rapid setting, and stop-seconds for precise time setting, 18K yellow gold Jubilee bracelet with five-piece links, concealed folding Crownclasp buckle. Waterproof to 100 meters. 28mm 18K yellow gold oyster case, screw-down crown with twinlock double waterproofness system, fluted bezel, scratch-resistant sapphire crystal with cyclops lens over the date and double anti-reflective coating, silver dial, 9 diamonds set in star shaped hour marker settings and 8 diamond set in Roman numeral IX, Rolex calibre 2236 automatic movement with center hour, minute and seconds hands, instantaneous date with rapid setting, and stop-seconds for precise time setting, 18K yellow gold Jubilee bracelet with five-piece links, concealed folding Crownclasp buckle. Waterproof to 100 meters. 28mm 18K yellow gold oyster case, screw-down crown with twinlock double waterproofness system, fluted bezel, scratch-resistant sapphire crystal with cyclops lens over the date and double anti-reflective coating, silver dial, index hour markers with Chromalight, Rolex calibre 2236 automatic movement with center hour, minute and seconds hands, instantaneous date with rapid setting, and stop-seconds for precise time setting, 18K yellow gold Jubilee bracelet with five-piece links, concealed folding Crownclasp buckle. Waterproof to 100 meters. 28mm 18K yellow gold oyster case, screw-down crown with twinlock double waterproofness system, fluted bezel, scratch-resistant sapphire crystal with cyclops lens over the date and double anti-reflective coating, white dial, Roman numerals, Rolex calibre 2236 automatic movement with center hour, minute and seconds hands, instantaneous date with rapid setting, and stop-seconds for precise time setting, 18K yellow gold Jubilee bracelet with five-piece links, concealed folding Crownclasp buckle. Waterproof to 100 meters.